Banbury United made it back-to-back wins in Evo-Stik League South after they beat King’s Lynn Town. Goals in each half from Greg Kaziboni, with his 12th of the season, and substitute Amer Awadh earned the Puritans a 2-0 victory in Saturday’s premier division central clash at the Banbury Plant Hire Community Stadium. But it was keeper Jack Harding who kept United in the contest with a string of fine saves in each half against the promotion chasers. 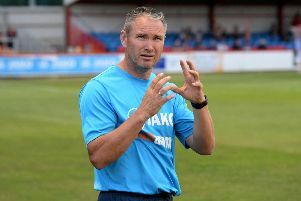 Manager Mike Ford named unchanged starting line-up following United’s first away success of 2019. But the Linnets began confidently and a neat move ended with Ryan Jarvis picking out Adam Marriott but his shot was deflected wide by Charlie Wise. Chris Henderson shot wide from the edge of the box before Harding produced a fine save to keep out Marriott’s volley from Michael Gash’s low cross. All the chances came from the visitors with the experienced Marriott at the heart of everything. Henderson’s close range effort from Ross Barrows’ low cross was deflected over while Aaron Jones found Marriott who fired wide from 15 yards. United’s defence had to work overtime to keep the Linnets at bay and Harding twice came to United’s rescue, keeping out a fierce drive from Marriott before turning a low drive from Gash around his near post. But United broke the deadlock two minutes before the break when Kaziboni won possession in his own half, raced clear and cut inside before curling the ball over Alex Street and into the top corner of the net. And United almost doubled their lead in stoppage-time when Joe Iaciofano took advantage of a mix-up between Street and Rory McAuley before the keeper recovered to deny the Northampton Town loanee as he was about to roll the ball into an empty net. After the restart Harry Whitehead headed over from Giorgio Rasulo’s corner before Harding denied Barrows at his near post. Barrows enjoyed plenty of room down the right and from another of the full-back’s crosses, central defender Ryan Fryatt fired wide at the near post. The second half continued in a similar pattern to the first but the Linnets’ final ball was not of the same quality and United’s defence looked solid and well organised. United had limited opportunities but Kaziboni should have done better after cutting into the box again. Substitute Michael Lunan’s low drive was turned around the post by Harding as the visitors pressed for the equaliser. Harding was quickly off his line to foil Jones after he cut in to the six-yard box following another good build-up as the pressure increased. Kaziboni did well to create an opening for himself in the box but Street was able to make a routine save. United looked dangerous on the break and Awadh chased a lost cause, managed to keep the ball in but Kaziboni was unable take advantage. A quick counter-attack saw Kaziboni and Rasulo combine to set up Awadh who saw his effort palmed away by Street. The game opened up and chances came at both ends, with Harding denying substitute Harry Limb with another fine save. United sealed the points in the 88th minute when George Nash did well to win possession in his own half and send Awadh clear. The young substitute still had a lot to do as he raced away from the halfway line but he went past the retreating Fryatt and Barrows, into the box and chipped the advancing Street with a finish out of the top drawer.